Descubra un amplio abanico de hoteles en Chamonix, para su estancia al pie del Mont Blanc. Del hotel familiar y de turismo al establecimiento 5 estrellas, todos nuestros hoteles conjugan un gran confort, un servicio irreprochable y un entorno natural excepcional. Elija el hotel que convertirá sus vacaciones de invierno o de verano en Chamonix en un momento inolvidable en el corazón de los Alpes. Since 1849, the legendary hotel is an institution in Chamonix, ideally located a few steps from the main street, the building represents the typical archit... Book now ! 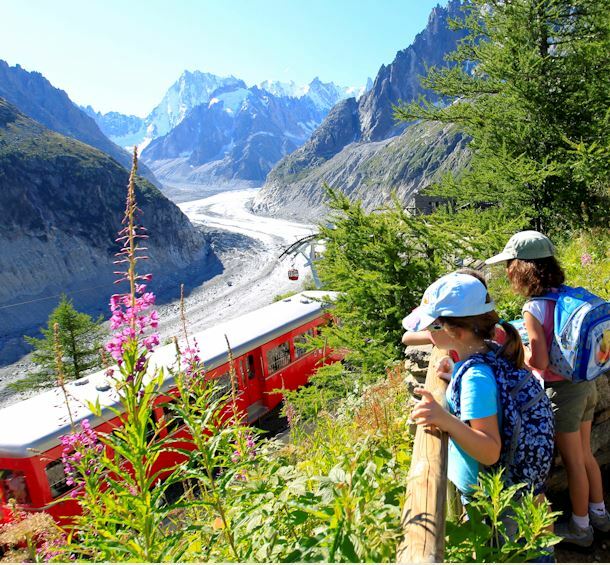 Admired from the sunny side of the Chamonix valley, Mont blanc proudly stands in front of us like an internationally aknoweldge alpine gem.... Book now ! A true little hamlet well situated near the town centre in Chamonix Mont Blanc, this five-star hotel run by the Maillet-Carrier family since 1903 is an ins... Book now ! The Hotel Excelsior represents first and foremost the history of the Cheilan family, devotees of the hotel business for 4 generations... Book now ! ¡Alpina Hotel se ha convertido en el Alpina Eclectic Hotel! Venga a descubrir el nuevo hotel de 4 estrellas de Chamonix, totalmente renovado, con un ambie... Book now ! Facing the Mont Blanc Massif, located in the center of Chamonix, La Folie Douce Hotels offers a tailor-made stay, adapted to all tastes, all desires and al... Book now ! Set right at the heart of Chamonix, this 4-star hotel offers you the chance to enjoy an active yet cosy stay in the mountains. Newly refurbished, this mode... Book now ! Built in 1840, the Grand Hotel des Alpes remains one of the most prestigious hotels in Chamonix throughout the history of the valley.... Book now ! Four star Heliopic Hotel & Spa is located at the foot of Aiguille du Midi lift. If you come as a couple, family or group for a special event, our 4 star h... Book now ! The Park Hotel Suisse & Spa is located in the city centre of Chamonix, opposite to the tourism office and only 50 meters away from the bus stop, where shut... Book now ! Situated in the splendid hamlet of Le Lavancher at 1200m and only 7 km north of Chamonix - a perfect spot for nature lovers in search of quietude !... Book now ! Just footsteps from the Aiguille du midi cable car and resort's pedestrian area, discover a charming hotel located on a prestigious site with breathtaking ... Book now ! El hotel está situado al pie de las famosas montañas del Mont Blanc y de la Aiguille du Midi, en pleno corazón de la ciudad de esquí de Chamonix y a pocos ... Book now ! Situated in Argentière at the foot of the Grands Montets, this charming chalet hotel will seduce you with the warmth of its welcome and is unique décor.... Book now ! This comfortable, cozy chalet based on a renovated 1796 farmhouse offers 8 well-lit, spacious rooms for an authentic holiday at the foot of the Aiguilles d... Book now ! In the heart of Chamonix and very close to the train station you’ll find the Langley Hotel Gustavia, a charming, comfortable, fifty-room hotel with great a... Book now ! The Hotel Vallée Blanche is a family-run hotel with a warm and friendly atmosphere. The hotel was completly renoved this year.... Book now ! Delightful little hotel-restaurant enjoying a quiet location in the heart of Chamonix... Book now ! In the centre of Argentière, in this hotel plenty of character (since 1865), you will find a welcoming reception and comfortable rooms facing the Mt. Blanc... Book now ! Located at the very entrance of Chamonix and with a unique view of the Mont Blanc, the Saint Antoine Hotel is the most recommended adress to enjoy a warm a... Book now ! L'Hôtel*** & Chalet*** du Bois are located in the charming village of Les Houches.... Book now ! Ideally situated in the Chamonix premier golf course, with breathtaking views throughout Mont Blanc, Aiguille du midi, Drus and also within 250 meters of t... Book now ! Delightful Savoyard style hotel, situated just a short walk from the centre of Chamonix and next to the Aiguille du Midi cable car... Book now ! Welcome to the Aiguille du Midi hotel, where the tradition of over 100 years and 5 generations of the same family of hoteliers... Book now ! Muy bien situado en el corazón de Chamonix, con su aparcamiento privado desde 1793. Cada habitación tiene su propia historia y es diferente.... Book now ! Located in the heart of Chamonix , l'Auberge du Manoir is a 3 star hotel with a cosy atmosphere . Customer well-being is our priority.... Book now ! Este gran chalet hotel de estilo saboyano está impregnado de sol y combina armoniosamente una cálida bienvenida con su gama de servicios, todo eso orientad... Book now ! Ideally located 4 minutes from Chamonix at Les Houches, the RockyPop Hotel breaks the convention of the traditional hotel business.... Book now ! Operated for 105 years by the same family, this charming hotel located just steps from the heart of town invites you to relish the placid atmosphere of Cha... Book now ! Hotel Pointe Isabelle is a modern hotel with a heritage , ideally situated in the heart of Chamonix .... Book now ! Our 19 rooms and charming Le Refuge restaurant and bar make this hotel one of the most convivial place of Chamonix with the added bonus of being next to... Book now ! In the heart of Chamonix, close to the shops and the main street of the city, l’Hôtel de l’Arve offers you an unique location in the Mont-Blanc valley.... Book now ! Le Faucigny is a 28-room boutique hotel ideally located in the heart of Chamonix: a stone’s throw from shops and restaurants, 3-minute away from the Savoy ... Book now ! "LE DAHU" hotel welcomes you in both summer and winter in a convivial and warm homely atmosphere. Make yourself at home.... Book now ! Arveyron is a friendly and family hotel, with restaurant in a privileged site: in the "Bois du Bouchet", at the feet of the Mont Blanc Range, just near eno... Book now ! Small family run hotel offering 23 comfortable rooms. Located close to the climbing rocks and the lake in Les Gaillands... Book now ! This is a welcoming place managed by the same family for three generations. It offers the charm of an era as well as modern convenience.... Book now ! Les Campanules welcome all the year around situated just in Les Houches, close to Chamonix Mont Blanc.... Book now ! La Chaumière is in an enviable location, within 10 minutes walking distance of the main shopping street and the picturesque Lac des Gaillands and its famou... Book now !